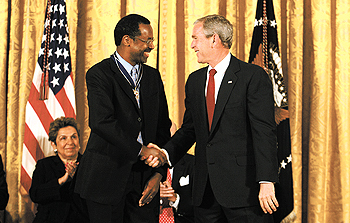 President Bush shakes hands with Benjamin Carson after presenting him with the 2008 Presidential Medal of Freedom. Johns Hopkins Children's Center neurosurgeon Benjamin S. Carson Sr. received the nation's highest civilian award, the Presidential Medal of Freedom, in a White House ceremony on June 19. Carson, who was in surgery on June 11 when he heard the news, said, "I am humbled by President Bush's recognition of my work. I am extremely grateful that he chose to honor me not only for my work as a neurosurgeon but also for my efforts to improve the lives of America's youth. I am blessed to have the opportunity to pursue both paths, which I consider equally important." Established by executive order in 1963, the medal may be awarded by the president "to any person who has made an especially meritorious contribution to (1) the security or national interests of the United States, or (2) world peace or (3) cultural or other significant public or private endeavors." Carson is renowned for his innovative and groundbreaking neurosurgeries, which include separations of twins joined at the head and hemispherectomies, surgeries in which a portion of the brain is removed to stem intractable seizures in children. At Johns Hopkins, where he has directed the Division of Pediatric Neurosurgery for nearly a quarter of a century, Carson co-directs the Craniofacial Center and is a professor of oncology, plastic surgery and pediatrics. Carson is also a philanthropist, author and motivator of youth to rise above circumstances of upbringing or hardship to lead meaningful, accomplished and compassionate lives. Motivated by a mother who challenged her sons to strive for excellence and insisted on reading over TV viewing and other idle pursuits, he moved on from a childhood life of poverty in Detroit's inner city to graduate from Yale University, 1973, and University of Michigan School of Medicine, 1977. He subsequently trained in pediatric neurosurgery at Johns Hopkins before joining its faculty. Carson is president and co-founder of the Carson Scholars Fund, which recognizes young people of all backgrounds for exceptional academic and humanitarian accomplishments. He also co-founded Angels of the OR, which provides grants to assist families with noncovered medical care expenses involving both adult and pediatric neurosurgery. Throughout the school year, he shares his inspirational medical and personal story with groups of schoolchildren in Johns Hopkins Medicine's largest lecture hall. His three books, Gifted Hands: The Ben Carson Story, Think Big and The Big Picture, offer inspiration and insight for leading a successful life. A fourth, Take the Risk: Learning to Identify, Choose and Live with Acceptable Risk, was released in early 2008. Carson has been married for more than 30 years to his wife, Candy, and is the father of three sons. His mother, Sonya Carson, lives with them. Carson holds more than 40 honorary doctorates and has received hundreds of other awards. He is a member of the Alpha Omega Alpha Honor Medical Society, the Horatio Alger Society of Distinguished Americans and many other prestigious organizations. He serves on the board of directors of numerous organizations, including the Academy of Achievement, and is an emeritus fellow of the Yale Corp., the governing body of his alma mater. In 2004, President Bush appointed him to serve on the President's Council on Bioethics. That same year, on the occasion of its 200th anniversary, the Library of Congress selected him as one of its 89 Living Legends. In 2006, the NAACP bestowed upon him its highest honor, the Spingarn Medal. "Benjamin S. Carson Sr., M.D., has worked throughout his career to improve the lives of those suffering from neurological disorders," said the White House in its press release announcing this year's Presidential Medal of Freedom recipients. "His groundbreaking contributions to medicine and his inspiring efforts to help America's youth fulfill their potential have strengthened our nation." Joining Carson in receiving the 2008 awards were Anthony Fauci, M.D. ; Tom Lantos; Gen. Peter Pace, U.S. Marine Corps (Ret. ); Donna Shalala; and Laurence Silberman. SEE ALSO "ENDOWED PROFESSORSHIP HONORS CARSON"
GO TO JUNE 23, 2008 TABLE OF CONTENTS.